As a pro photographer, I have to keep up with the ever-changing technology that plagues this profession. Seems that every other week there's a new camera with more megapixels, more dynamic range, more this or more that. Although it would be nice to have each new iteration of a favourite camera, thankfully, the technology has reached the point where I can slow down and really analyze whether the latest/greatest is actually going to benefit ME. Like my iPhone, I find I can 'skip' an upgrade or two, yet still maintain the quality and efficiency that I need to operate my business. That being said, I still keep my eyes open for changes that can affect my efficiency, my quality and yes, even my enjoyment of photography. One of these advancements in technology that I've had my eye on is currently in development by a company called Light. Light.co is developing a new camera, the L16, that has not just one but 16 lenses and light sensors to record an image. But what impresses me is the sophisticated software that combines these separate images into a 50+ MP image! Their slogan of "DSLR quality in the palm of your hand" sounds outrageous to most advanced or pro photographers, but I do think this is a product worth keeping an eye on. I can see myself slipping it into the pocket of my jacket when I take my motorcycle out for a spin. This blog post is based on Light.co's #VantagePoint Project. They're interested in a photographer's perspective of photographing a favourite location or subject, how or why they choose the particular vantage point to shoot from and how their equipment helped them capture the image. You can view more images submitted by other photographers sharing their favourite locations on their #VantagePoint Pinterest board. This past weekend I got together with a couple of buddies for an afternoon of nothing but talking photography and driving around the countryside looking for a great image. It's nearing the end of January, but we've had a warming spell (+4C today! wooo whoo) and there was a light fog over the melting landscape. We set out chasing the fog, but as fast as we would go, the fog seemed to dissipate before us, that is until we headed back toward the lake (Georgian Bay). The scene we stopped to photograph is one that I've photographed many times before, and in fact, stopped there on the way to meet my friends that morning to grab a shot with my trusty FujiFilm X100T with it's fixed 35mm (equivalent) lens (see photo at right). The beauty of this particular scene is the awesome lone Maple Tree that sits out in the field. I've photographed this tree by itself many times but this afternoon I wanted to capture something I hadn't before. The fog was fairly thick but slowly dissipating. We had to work quickly and deliberately. To digress a little, back in film days when every shot cost money to shoot (the film), develop (the chemicals) and print (the paper) - just so you could see what you photographed - you took your time and tried to make every single shot count. Digital comes along and other than the cost of the camera, and yes, the computer system too (but most people have that nowadays), you can shoot as long as you have space on your memory card or until your battery and spares run out. Literally thousands of images! I thought of setting my camera and shooting everything I could before the fog left, but instead, decided to shoot 'old school', like film. First of all, I always shoot on a tripod - at least with my 'big' camera, the Nikon D800e. A tripod forces you to slow down and think about what you're doing. You concentrate on the composition rather than holding the camera steady. I mounted the camera along with my trusty 24-70mm f:2.8 lens onto my Gitzo Carbon-Fibre tripod with a Really Right Stuff BH-55 ball head. I knew from experience and from shooting this scene before, that I would probably shoot somewhere around the 50mm - 60mm range so went straight for this lens. When you need to work quickly your equipment needs to facilitate this. A slow, heavy, cumbersome tripod or head can be very frustrating to work with. The Nikon D800e at 36MP is closer to shooting medium format when it comes to technique, so your support system has to be solid. The carbon fibre Gitzo makes light work out of being solid and the RRS ball-head with matching L-Plate on my D800e means I can position my camera very quickly where I want it, and switch from vertical to horizontal in about two seconds - without having to reposition my set up to get the same perspective. The lens ends up in the exact same position! Cool eh! The 'old school' comes in that because my equipment can be deployed quickly, I can now take my time to find the #VantagePoint to create the image I envision. So I walk. Before looking through the camera itself I take in the scene with my own eyes, unobstructed. Take a deep breath and embed the view in your mind. Too many people just hold up their camera and snap away without taking the time to actually enjoy the view. I walked to a viewpoint that I hadn't photographed this scene from in the past. It's a different look, and I like the image, but it's a little 'flat' for what I envisioned that day. However, moving the camera and tripod a few inches allowed me to place the Maple Tree directly between the two buildings and balance the composition with the fence and other tree on the left hand side. I also like this image in B&W rather than colour. The machinery on the right was bright red and distracted too much from the buildings and tree that I wanted to be the main focus. Walking around the scene allows you to explore other possibilities and if I had simply set up the camera where we parked and started shooting I wouldn't have seen this composition. But like I said, it's not the image I was after. So I walked some more. 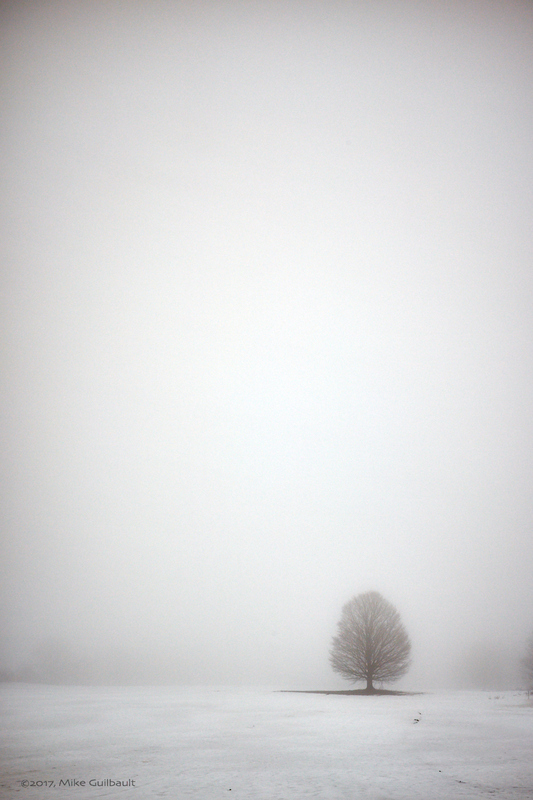 The problem with fog is that it tends to really flatten an image, especially in the winter. I wanted to create an image that lead the viewer from the foreground to the background, to lead them through the snow to the subject of the composition. I needed another element, and that element was another fence. I took my time to find the right composition. Move too far to the right and the foreground fence would be too straight on and not lead the eye to the buildings. I wanted the second fence line, between the Maple and the foreground fence, to be visible as well and not be 'cut into' by the foreground fence. For that I needed to gain some height. Luckily, the four foot snow bank in front of me worked well to get me higher than my 5'6" frame. From that #VantagePoint, the composition came together. All the fences lead the viewer to the buildings. That beautifully formed Maple Tree, almost disappearing in the fog, balances the 'weight' of the buildings as well as the strong graphic element of the foreground fence post. And, the visual 'permission' to move through the image emphasizes this. The viewer can easily step over the wire fence and walk back to the buildings or even out into the field to the tree without obstruction. The eye can follow the same path. I left this image in colour because I like the warmth of the wood and dried plants of the foreground. The background elements are near enough to Black & White on their own that I wanted the 'splash of colour' to add a peaceful warmth to the image. Now, the only question is, should I flip the image? Subscribe below for news, announcements, upcoming events, successes, tips and other information you might find useful. MPIO's 2016 International Nature Photographer of the Year!